This week I am paying tribute to some of my favorite children fiction books and the writers who captivated me with their words. I have been an avid reader ever since I learned to read by myself at the age of seven. The magic of the story in those first books I read will stay with me forever. And I know that same magic is what compels me to write books for children. Black Beauty opens with its main character describing his first memory as that of a "pleasant meadow." He narrates about his life as a colt, his mother's advice on how to behave as a well-bred horse, and his master's kind care. When Black Beauty is two, he witnesses the brutality of a rabbit hunt and the tragedy of one of the riders being killed in a fall from his horse. At age four, Black Beauty is broken in to the use of the saddle, bridle, and carriage harness. The book is a masterful work of Black Beauty's life, written through the eyes of the wonderful horse that he is. Sewell's intention in writing the book was to promote the humane treatment of horses.While teaching animal welfare, it also teaches to treat people with respect and kindness. It was written in the last years of her life. She lived several months after its publication to witness the success of her novel. Black Beauty was the only book that Sewell wrote, and she sold the manuscript for only twenty pounds. In my opinion, Black Beauty is the greatest story ever told. I cried and laughed and cried again. The Gnome-Mobile is a delightful story about two children and their uncle who stumble upon a pair of gnomes in the forest. They befriend the "little people" and protect them from a freak show entrepreneur and a group of unscrupulous land developers that want to destroy the forest. This task becomes even more difficult when the uncle is thrown into a mental institution because he is seeing the gnomes! This is one of the great fantasy kids books. A story with humor, friendship and adventure. "Nikki Nikki Tembo No So Rembo Oo Ma Moochi Gamma Gamma Goochi" is the name of a little Chinese boy in a story called "Long Name No Can Say" narrated by Paul Wing. It was available as a recording in the mid-1940's. There have been many variations of the same story subsequent to that time period, which is perhaps the origin of the "Tikki Tikki " variety written by Arlene Mosel, 1968. The story presumes to function as an aetiological myth about why Chinese names are so short today. I do not know who originally wrote this story. It is a story that has many different names. I knew the story as Nikki Nikki Tembo. As a child, my family told this story so many times, we have memorized the Chinese boy's name and can say it very fast. His full name is: Nikki Nikki Tembo No So Rembo Oo Ma Moochi Gamma Gamma Goochi. This is one of the best children's books ever. I have been taken on many adventures, into many fascinating worlds, through the magic of books. Some are funny, some are sad. Others are good and still other are great. Whatever the adventure, whatever the story, it was created out of pure imagination by the author. And for that, I give honor to all writers..
Labels: best children's books, children fiction books, fantasy kids books. I've recently had foot surgery and am I still having trouble sitting at the computer for any length of time, most probably from the effect of all the pain killers. It's just not fun yet. In the meantime, please have a look at my new author's website and let me know what you think. We are still working on getting little characters up on the Kid Page where kids can click on them and get information (and some little known facts) about the characters from book one, Sir Princess Petra - The Pen Pieyu Adventures. King Sillyknot has sent me on yet another quest to rescue his wife, Lily, from the lair of the dragon. The job pays 3 quill pens per week, which is a good and fair wage for a hero. You see, I am a hero by day and a writer by night, so the quill pens are needed. 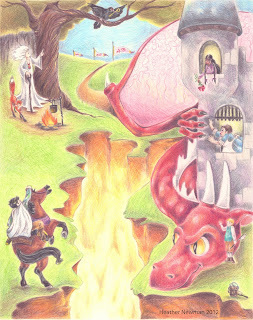 The dragon, Tullula, of the Witless Kingdom captures Lily Sillyknot on a weekly basis, holding her ransom. The ransom never comes because King Sillyknot is very cheap, hence, my hero job. Tullula is quite easy to trick and easier to embarrass. He now turns instantly pink the moment he sees me. I have tricked him with such lures as; home movies, dancing girls, jugglers, and his favorite, Mars bars. All I have to do is distract him with something simple, then get Lily down from the tower and take her home. The job has become somewhat mundane except in my inventiveness to distract Tullula. “Do you see that?” I yell in fake surprise, pointing to my newest distraction. Today I have brought along the palace chef who is frantically tossing pizza dough. Tullula’s embarrassed-pink color pales while he’s subdued, drooling and gawking at the chef. I dismount my steed, go around back of the dragon, walk the 59 paces to the tower, yell to Lilly it’s safe, she comes down, and we leave. “Au revoir,” I bid to Tullula, and we are already off and galloping when Tullula’s pink color intensifies. The 250 word children story contest, created by Susanna Leonard Hill. The contest is for a children's story of 250 words or less based on the picture above and in which somebody somewhere in your story says, in dialogue, "Did/do you see that?" (you may substitute any of the other senses - "Did/do you hear/feel/taste/smell that?") and somebody somewhere in your story says, "Goodbye!" (you are allowed to substitute "Farewell! ", "Au revoir! ", "Sayonara! ", "Ciao! ", or "So long!") Entries must be posted on your blog between Friday August 31 and Tuesday September 4 at 11:59 PM EDT.